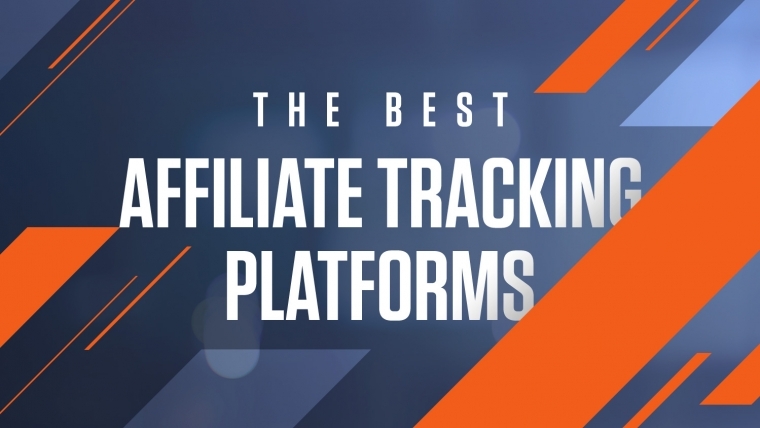 Feel like it’s time for you to check a list of the best affiliate tracking platforms you can use in affiliate marketing? Go for it! Tracking, analyzing and optimizing all your actions is the name of the game! In particular, Media Buying is all about performing a thorough and complete analysis and then tracking all your campaigns and actions. These actions can range from a bid change, capping increase/decrease, offer testing, landing pages, or split tests, among many other options. Are you losing money on a campaign? If not, how much are you doing with it? And where is it all happening? Tools such as tracking platforms are essential to simplify testing, organize your campaigns, and analyze the actions you’ll have to take. In case you wanna scale up volumes, these tools are simply crucial! The purpose of this article is to give you a review of some pretty well-known affiliate tracking platforms in the market and to compare them qualitatively and quantitatively. These are all well-established platforms in the market with a lot of experience in the industry. At the end, we’ll come up with cool conclusions about which one deserves the highest grade. Moreover, we’re also gonna tell you about a new sweet platform that’s got incredible tracker capabilities you can explore to the max! It’ll be difficult for you to decide which is the coolest platform for you but let’s begin this journey! Voluum is one of the most popular affiliate tracking platforms around. It has a whole lotta features, which makes it one of the most complete platforms in the market. Voluum doesn’t have a self-hosted platform service. This approach allows for a focus on the cloud-hosted service and its features. The cloud service is an awesome motivation for many hopeful affiliate marketers who wanna get to know this platform. You know you won’t need to invest in servers or their management. In fact, all services are managed by the platform, which really does mean that a heavy burden has been taken away from your life. The fact that Voluum has data centers in different countries will surely have a positive impact on your performance. The click loss and latency will be lower, which means more profit for the user. Cloud hosting offers other advantages, such as data protection. You’ll definitely feel more secure against third parties than if you were to manage your own server, or shared servers. We’re not saying that this is true for everybody. Even so, if you’re a pro on managing servers, we imagine you’d like to have your own solution. This is a very interesting solution for newbies who are only at the start of their road to success, and also for experienced clients who don’t wanna waste their time. Voluum has created a lot of cool services which really simplify your life. The fact that these guys have also founded an ad network – Zeropark – also helps you understand why the platform is made for the user. It’s clear that one of the most important features in a tracking platform is how simple it is to integrate traffic sources and affiliate networks. On Voluum, you’ve got a great number of platforms which are already created and ready to go. For example, it’s very easy to integrate with any one of these predefined traffic sources. Voluum has a great variety of stats you can check and analyze. You can analyze Affiliate Network, Countries, Carriers, Clicks, Browsers, Browser Version, City, Connection Type, Conversions (clickid info), Country, Day, Day of the Week, Device Type, Hour of the Day, IP, ISP, Landers, Language, Mobile Carrier, Models, Month, OS, OS Version, Offers, Referrer, Referrer Domain, or State/Region, among others. As you can see, you’ve got a lot of stats which allow you to get the best possible solutions after thoroughly checking your detailed analysis. It really goes deep into granular results. The goal is not only to have a great number of stats but also to think about how to present them to users. Voluum makes it happen, alright! It’s implemented tree structure tables, which makes it simple to both visualize and analyze. A split test is really gonna be essential as you increase the number of campaigns in which you use Single Offers. Split traffic, analyze the best offers, and drive 100% of traffic to your best one. Single offers and landing pages are obviously related. A good landing page for the correct offer will boost your revenues high into the sky. A landing page rotator is paramount to test and split traffic. When you find the right combination, you know what to do. Drive all your traffic to it, like a master who makes money faster! Costs are one of the main points to consider when you choose a tracking platform. Check the following image to see the packs Voluum has got for you! As for other platforms, the prices vary, depending on the features you want and – even more important – on the volumes you wanna reach. BeMob is a cloud-based tracker for affiliates, media buyers and teams. This tracking solution has the complete set of tools to run your ad campaigns in the most efficient way: fast redirects, user-friendly interface, extensive list of pre-configured traffic sources and affiliate networks, detailed reporting and API access. SSL for custom domains: The certificate for the custom domain is provided automatically after your domain is added in tracker. Unlimited campaign offers: or other perks depending on the pricing plan. Advanced traffic distribution system: Their rule-based system allows to base the traffic distribution on 30+ conditions. A friendly support team: The support is mostly via live chat. During working hours the response time is 2 minutes. The team is friendly to newbies and always glad to assist with the settings. No-redirect tracking for organic traffic. Landing page security script: keep your landers away from ad spy tools. Multi-user access: for team accounts with different access levels. The auto optimization tool for campaigns: The Sixth Sense allows you to analyze the wide range of combinations to identify the most profitable basing on CTR, ROI and revenue values. Loyal pricing: Take advantage of our exclusive BeMob coupon. Their pricing plans are flexible and affordable for newbies and experienced affiliates. As you can see below, you can even start for free. If you are not sure which tariff is the right fit, there’s a useful calculator to help you understand your needs better. Another good tracking software is Binom. They position themselves as the tracker for professionals. And it doesn’t come as a surprise, because it is a tracker created by a top Russian affiliate. 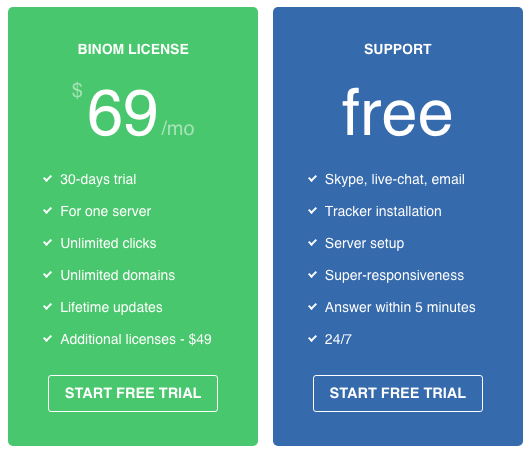 Binom launched as a private beta and was used by an internal affiliate community. That means that since its launch it’s been tweaked to offer functionalities needed in the CPA marketing. Among the main advantages are the speed of clicks redirecting and the speed of generating reports. You can connect via API and have access to all the functions and reports. The JSON format is used to send and receive data. Related content: What is an API and How Is It Used in Affiliate Marketing? The tracker has templates for popular traffic sources and affiliate networks which allows you to add a new source or network from a template in a few clicks. Reports are fundamental for any affiliate of media buyer who wants to optimize wisely and get a larger profit. Binom’s reports don’t disappoint. It’s a pleasure to work with this functionality because they are generated almost instantly. There is a system of filters to allow you to make decisions quickly or to generate white/black lists. Make a drill-down and go deep inside any analytical slice. It’s time to share Binom’s perhaps most unique feature – setting special tags for zones. It’s super useful because you can then select these groupings by the tags you’ve pre-set. There are more than 20 metrics to any click, which also include standard ones such as ISP, device, connection type, etc. The not so standard ones, are where the juice is. Binom allows you to get a report on the traffic, bot or bid uniqueness which is a game changer when you want to analyze where your maximum profit was. You can also generate two-dimensional tables where you indicate the parameters that interest you the most on the X and Y coordinates (a feature that was released with the new version of the tracker). The example below shows the zones (columns) and the country (rows) and as you can see it makes it very easy to understand which zone in which country works the best or is underperforming. If you’re choosing a teamwork-friendly tracker, you should definitely consider Binom. Request a demo license and start testing. You’ll be able to delegate rights on a campaign, landing page or offer level. The number of users you can give permissions to is unlimited. If you’ve got some privacy issues and don’t want to overshare, you can hide the profitability of your campaigns from the other team members. A professional tool without high-quality and quick support is a fail. Imagine you have a traffic issue caused by a technical problem – you won’t have time to wait for a reply to your ticket or email. The price is affordable and attractive. Forget about paying for used traffic or additional users, domains, support. It’s all included in the package and if you pay for a year, your monthly plan will be $69/Mo compared to $99/Mo otherwise. RedTrack is a cloud-hosted ad tracking software to manage and analyze your ad campaigns. It’s simple, yet sophisticated and enables media buyers and affiliates to get better returns on their investments. RedTrack is more than just a collection of features. The team behind it are all about the experience they create for their clients — prompt support, consistent service, hassle-free settings, and stable work. Weather you’ve had prior tracking experience or not — RedTrack is equally friendly for newbies and advanced users. It meets the needs and requirements of a user at every stage of their growth — starting from a solar affiliate with no prior experience to a professional affiliate or media buying team, and ending with the needs of an entire agency. Cloud-based tracker with multiple integrations: to use RedTrack you don’t need to hassle with servers or geo balancing. Just sign up – they support 90+ templates for major Advertising and Affiliate Networks that help you to set an ad campaign in minutes. Intuitive and clean interface: the navigation throughout the tracker is easy and intuitive, possible puzzling moments are supplied with pop-up tips. Data tables are easy-to-read and analyze, and you can customize the data columns in the way you need it — hide the columns with the information that you don’t need or change their places. Granular reporting with 30+ data points: for traffic monitoring and analysis, including source, network, offers, landers, geo (country, region, city), OS type and version, browser type and version, connection type, date and day parting, IP, ISP, referrer and referrer domain, proxy type, user agent, language, among others. Fits any traffic you work with: with RedTrack, you can track any traffic, both web and mobile (well-fitted with CPI campaigns tracking as well). For those who work with traffic sources that don’t allow to apply redirects (e.g. : Google, Yandex Facebook, etc.) or those who want to track organic traffic, RedTrack is a good solution. Today, an improved script for direct traffic tracking by RedTrack allows you to easily analyze direct traffic through additional parameters. Custom domains: RedTrack allows connecting an unlimited number of tracking domains. Multi-user access: define the access level for each member (view, edit, export), as well as limit access to financial data or particular Network or Source. Fraud/bot filtering. RedTrack helps to analyze and prevent bot traffic at several levels — via bot blacklisting, proxy filtering (data provided by one of the most accurate data providers — Digital Element), fraud checker (NEW) — add-on feature that analyzes your traffic and identifies suspicious behavior, aka bots. This comprehensive approach towards bot filtering guarantees that the user leverages several levels of bot protection, and enjoys detailed reports on fraudulent traffic. Flexible postback settings: the tracker offers 4 possible options for duplicate postback — the feature for pro-affiliates, but still super useful for receiving the full information about conversions (especially, for such verticals, as nutra, e-commerce, and gambling), etc. And many other basic and PRO features that are worth testing! 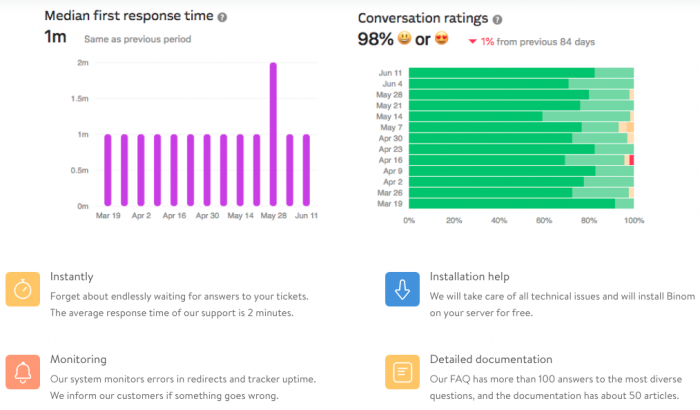 Customer support: RedTrack gives prompt replies, and can be reached via emails and Skype. Onboarding: It is a complementary service where the team will answer all possible questions, assist with settings and record the demo session for re-watch if needed. Knowledge sharing: They produce regular webinars with partners, video tutorials, interviews, whitepapers, case-studies and other types of content. Transparent 2-way communication: RedTrack are active on different industry forums and communities — and try to promptly assist with all the questions that arise there. We’ve also launched their Telegram Community to maintain consistent communication with users, support with tech questions, as well as share tracker updates, company news, and give bonuses. RedTrack has a 14-day FREE trial that is limited to 100,000 events — so you can easily know if the tracker suits your needs. Starter pack for 29$/month (290$/year) — 300,000 events. Professional for 79$/month (790$/year) — 3,000,000 events. Business for 339$/month (3,390$/year) — 15,000,000 events. Enterprise 939$/month (9,390$/year) — 50,000,000 events. ThriveTracker is one of the most important platforms in the market. As soon as you go through the registration process, you receive a presentation email that’s pretty well-structured! In it, you’ll get to know that ThriveTracker is a tracking platform to be used in all existing traffic sources. We’re talking about Ad Networks, DSPs, Facebook, Twitter, and other traffic sources. On ThriveTracker, you can easily create campaigns in bulk. You also get clean data. That means you have access to granular data such as specific browsers, periods of the day, or targets. Moreover, you get to optimize your banners to the max. In fact, it’ll be easy for you to get combinations between the best banners, spots, or campaigns. You can also explore split testing. You can always split the traffic between your landing pages and check the best-performing ones. Apart from these fantastic features, you’ll also be able to take advantage of awesome algorithms which automatically optimize your campaigns based on CTRs, ROIs, and loss. These are interesting features, no doubt about it. In this platform, you get that sweet optimal performance with the Cloud Service that’s connected with the Amazon cloud infrastructure. The company is so certain that it even allows you to provide a competitor’s campaign link. Then, it’ll show you that indeed its platform is faster than the competition. A Landing Page Pixel for click tracking is available. It’s a great feature if you work on Facebook, Twitter, Google Ads among others. Why? Because you can set your landing page as a final destination URL. It’s perfect to use with CDN, as it decreases the latency and therefore increases performance. ThriveTracker is simple to integrate and it’s “Mobile friendly” as it’s specifically optimized to have the lowest latency on mobile traffic. You’ve got data for country, carrier, OS, device, browser, and other parameters. You can set up a group of rules to redirect traffic to different landers or offers. You can set dayparting and weekparting, setting up both hours and days. And you get to do this without having to edit a single line of code. With so much data available, you’ve just gotta test and retest. Be creative, check the stats, and come up with the right conclusions! As expected from a big tracking system solution, ThriveTracker has got reports with a high degree of information. Its tree reports structure is very clear and you can combine and analyze a large number of variables. You’re able to group by Campaigns Created, Country, Carrier, Devices, Landing, Creative, among other parameters. 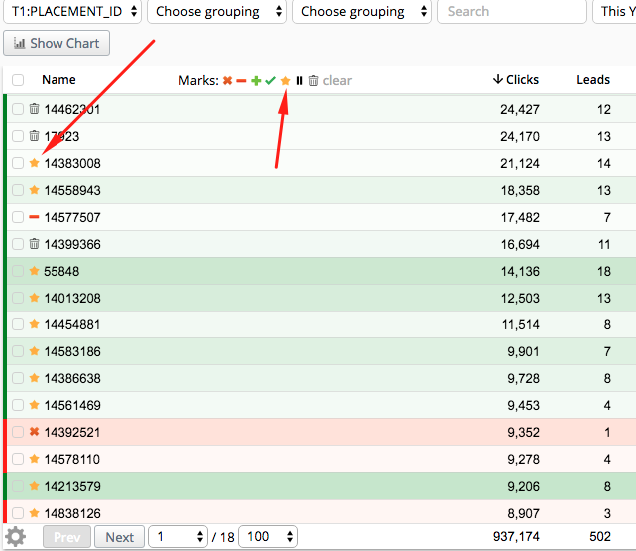 For these combinations, you’ll be able to visualize stats as Clicks, Conversions, CTR, CR, Costs, Profits, among others. These detailed reports are excellent for a full and complete analysis of your traffic which will allow each platform user to get the best of their campaign. In other words, it’s a revenue booster! As for other platforms, costs will always depend on the type of service you want to subscribe to. If you don’t have problems setting up servers, the Self-Hosted service can be a solution. It costs 99$ per month but be aware of additional expenses arising from the number of events and database increase. If you wanna really scale up, you may consider hiring a new staff member to handle all the technical problems which may come about. If you prefer using a managed cloud service, you’ve got different prices, depending on the volumes you’ll send. Don’t forget about the cloud service upgrades and the amount of work/expenses expected if you select the self-hosted service. If you have low volumes, a self-hosted solution seems to be the most interesting but when you scale up the volumes, and take those extra expenses into account… that’s when you’ll probably end up going for the cloud service. AdsBridge is one of the biggest tracking solutions in the market and it provides a number of advantages in comparison with other trackers. It’s also one of the tracking solutions that large players prefer. We’re referring to affiliate networks which put their entire tracking game in this platform’s hands. The platform also has an easy integration with some of its “trusted partners” which allows you do an integration in less than 5 minutes. If you’re gonna invest money on a tracker, the service you’re gonna be paying for better be a well-established player with good partners in the industry! Fortunately, AdsBridge is a good option due to the fact that it allows you to have direct integration with a number of its “Trusted Partners”. These are basically well-established affiliate networks and traffic sources. You can do an S2S integration with them in less than 5 minutes. What this means is that some of the dopest affiliate networks in the industry have partnered up with AdsBridge in order to make the integration much smoother. The stats you’re actually looking to get from all the different tools, offers, traffic sources, etc, that you work with. The stats provided can be very detailed and will let you know where and which optimizations you should be doing quite fast. They’re constantly being updated, with rare delays of 2 minutes tops. As we’ve mentioned before, the platform is quite user-friendly and this does help in the long run when you’ve got multiple campaigns running at the same time. 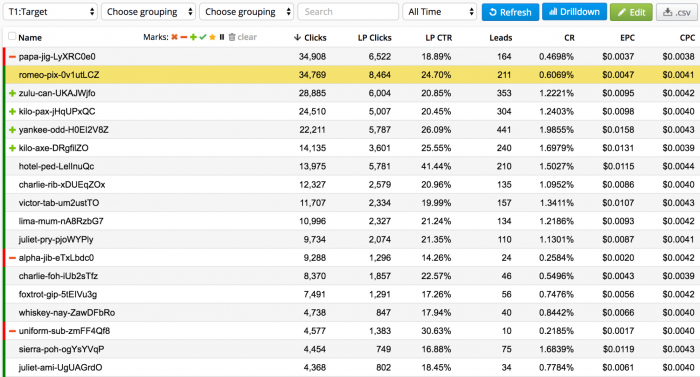 This is particularly useful if you’re an affiliate network that’s using this tracker, or someone with massive volumes overall in terms of campaigns. Time to check a quote taken from the features page presented by the company running this tracker. It means you can do split tests, create landing pages (AdsBridge even has templates for you to use in case you want to), customize, adjust, and improve them. It basically means you can split test different Landing Pages and, even better, that you’ve got pre-made templates you can then tweak and optimize “in just a few clicks”. AdsBridge works on a cloud hosting system with its own servers. The main advantage is the fact that it’s a more powerful system than Shared hosting, and resources are therefore sent to the end “user” (i.e. you) on a need-by-request basis right away. This is great, because it provides the services you need while keeping costs down and it also means you’re not depending on actual physical hardware issues. The pricing of AdsBridge is neither too expensive nor too cheap. Compared with other tracking solutions in the market, we reckon it’s slightly cheaper but it’s not something that’s gonna leave you shouting with joy, thinking about how superior AdsBridge is when compared with the other solutions available. The price is slightly cheaper if you happen to be billed annually. That being said, as your tracking needs grow, the platform does start to have its price advantage as a big plus, especially in its large scale “exclusive” solution, if you’re driving significant volumes of traffic. There are networks which use this tracker every single day. This means the savings must be significant, indeed! The first plan is very cheap. Even so, features such as the templates, detection of unique users, CPM cost models, auto optimizations, and “Trusted partner” affiliate networks integrations are unavailable. This means that the second plan may be a better choice, if you’re looking to take advantage of awesome features while saving some cash. One of the most well-known self-hosted tracking platforms. It allows you to create, optimize and adjust campaigns using a purely visual interface, requiring you to use zero coding skills! FunnelFlux works by postback by an S2S basis and is quite similar to the other tracking systems as far as integration with affiliate networks goes. That being said, one thing that does make this tracker stand out is the fact that – it being self-hosted – the initial setup will require some technical skills which the team at FunnelFlux is happy to help with. The stats provided by this tracker are amazing. First, you’ve got the ability to track by GEOs, Carriers, IPs, Operating Systems, among others. In total, you’ve got about 60 KPI you can use. You’ve got Custom tracking fields, built in statistical Significance analysis. The Powerful Statistics Engine and Funnel Heatmaps allow you to easily find bottlenecks or gold mines in a matter of seconds in a visually stimulating way. The stats are constantly updated and can work with Affiliate and direct Vendor funnels. API integration is also possible. Being self-hosted means you need to be sure your own server capacity can manage the volume of info you’re handling. You also have what’s known as the “Lifetime Value of Leads” which allows you to see whether the leads you’re paying for have a good return for the investment you’re making. More importantly, you’ve also got a Visual funnel builder which allows you to build and adjust the flows for the different campaigns you’re currently running. In this department, FunnelFlux is sort of a mixed bag. You have the ability to perform split tests and you can use any kind of landing pages. That’s great, no doubt about it. The “Visual Funnel Builder” makes the whole process very user-friendly as you don’t need any major technical skills to create the different flows for the different campaigns. You’ll literally “drag” the different parameters according to your needs. 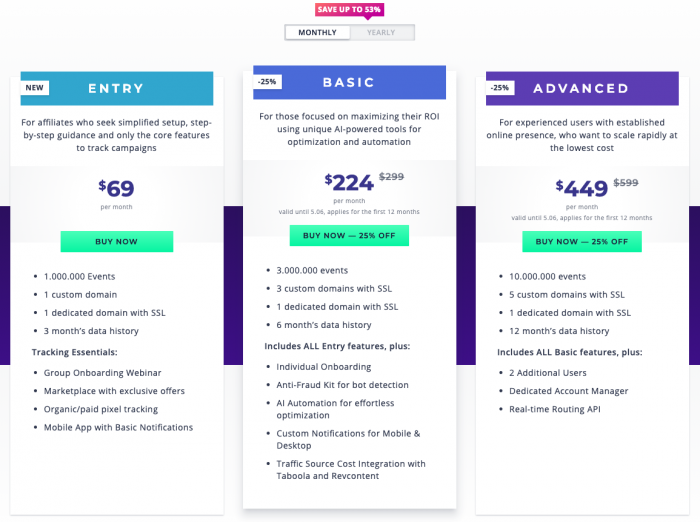 In other words, once you have the Landing Pages, you’ll just need to connect them to the tracker and start using the interface to easily make the campaigns run how you want them to run! FunnelFlux does not allow you to create Landing Pages. Instead, you’ll need an external software to create your landers, which is a bit annoying. Using a third-party software can increase your costs because of the licenses you need to pay for or just because of the additional time you have to waste going through the process. FunnelFlux is a self-hosted tracker. It means you’ll be responsible for finding the servers and physical structures needed to handle the info. At the same time, you’ll be paying the bill for those servers. FunnelFlux is automatically updated, so you don’t need to do anything extra in order to get the latest version. This does have the advantage of being a system you’ve created yourself which can be wicked in case you’ve got the resources to pay, someone to watch over it full time, and be a sort of in-house specialist in the matter. On the other hand, it also means you need to increase your capacity, since your tracking needs increase. This basically means that the cost “advertised” as being very cheap is not the total cost of the entire infrastructure. In case you’re hacked, your entire system can be compromised which is less likely to happen on a cloud hosting system. You need to ensure your hosting is well protected with backups in case issues arise. You may find the base price for “unlimited tracking” appealing, but you need to plan for other expenses a self-hosted solution requires you to deal with. If you wanna really scale up, you should consider hiring a new staff member to handle all the technical problems that may come your way. Last but not least, Mobidea! 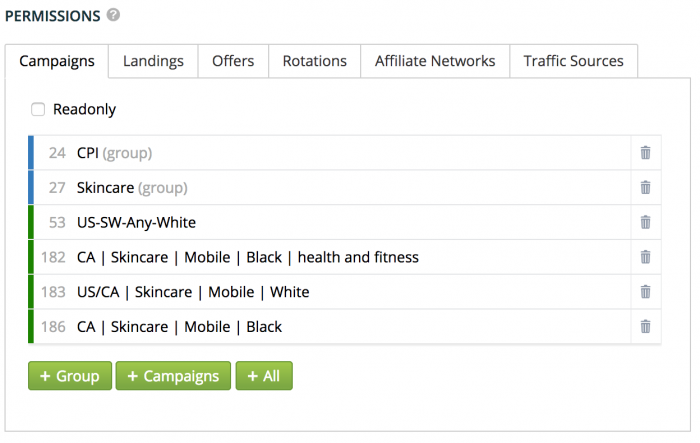 Mobidea has got some tremendously useful free affiliate tracker you can explore. This is the only affiliate network that allows you to have access to a wealth of analytical data. That – plus the fact that we’ve got the best Affiliate Service in the business – means that Mobidea can really help you track your campaigns, have access to reliable and hyper-detailed data, and increase affiliate marketing profits like a king. Our awesome tracker is completely free. This means there are no surprise commissions to hurt you or hidden fees that are meant to take more of your hard-earned cash! Another great aspect of Mobidea’s foolproof tracker? The fact that you can use it right now. No need to go through the hassle of a long approval process. You won’t have to wait around for weeks until you get the chance to explore this tool. Just sign up for Mobidea and prepare to make a lot of dough. The fact that we’ve got thousands of CPA offers you can promote. Moreover, our tracker integrates traffic sources by default. This means you don’t really have to waste time with the process of manual integration. 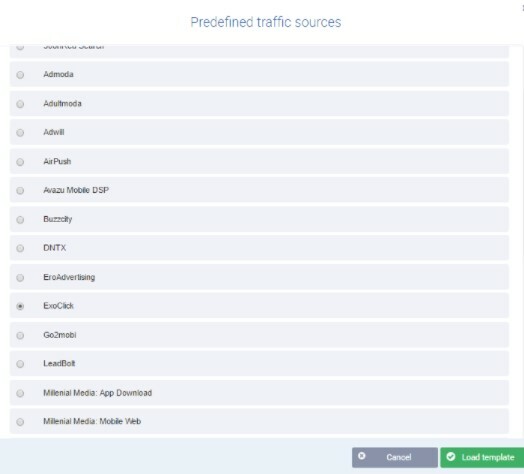 Mobidea has over 100 preconfigured traffic sources. Get ready to earn big. What about our phenomenal reports, which are both easy to navigate and super action-oriented? Get to check info about the performance of your affiliate campaigns for more than 23 different dimensions. Mobidea’s got a Live Feed of CPA Offers, Payments, and Signups. Just check your Mobidea dashboard and stay up to date like a cool master. Mobidea also allows you to use the famous Mobidea API. You can use it to get conversion stats. This means that integrating with other tools is easier than ever before. More incredible things about Mobidea’s new Tracking Capabilities? We’ve got a brand-new Opportunities section. It’s not only transparent but it also allows you to not have to test offers to ascertain their specific value. Just check each offer’s particular performance before actually promoting. The platform allows you to perform A/B testing by using rotation settings on your affiliate campaigns. Split that sweet traffic, test like a pro, and then just select the best Offers or the Smartlink. Your data is well taken care of, indeed. It’s actually hosted in several datacenters. This means you’ll get faster redirects via a hyper secure SaaS solution that’s got data encryption and private storage. As for your campaigns, they’re built on Clustered Domains. This will basically prevent affiliate blacklisting, since the domain configuration is not gonna be done through CNAME, but through DNS. Summarizing, the Mobidea Tracker has multiple data centers, the Smartlink, incredibly high-converting offers from a wealth of profitable verticals, the ability of performing A/B testing, bountiful amounts of analytical data for you to track every single aspect and optimize faster, a unique level of segmentation, a brand-new Opportunities section, the chance to use our API, a Live Feed of Offers, and the very best Affiliate Service in the entire galaxy, always available for you! This is the best mobile affiliate network of all time, bro! Ready to explore Mobidea’s new tracking capabilities? We both advise you to analyze the market, understand what your needs are, and try to adapt your media buying strategy. We know that you’ll begin experiencing one platform. With time, though, you’ll scale up and try another one which is more suited to your specific needs. We hope this article helped you, clarifying the positive/negative points of each affiliate tracking platform. Just remember that there isn’t one perfect solution for everyone – only a solution which can fit your needs.